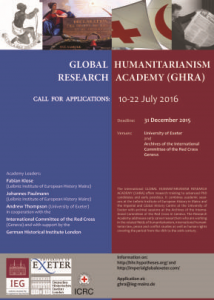 In ten days the second Global Humanitarianism Research Academy (GHRA) will meet for one week of academic training at the University of Exeter before continuing with archival research at the ICRC Archives in Geneva. The Research Academy addresses early career researchers who are working in the related fields of humanitarianism, international humanitarian law, peace and conflict studies as well as human rights covering the period from the 18th to the 20th century. It supports scholarship on the ideas and practices of humanitarianism in the context of international, imperial and global history thus advancing our understanding of global governance in humanitarian crises of the present. Nerissa Aksamit researches relief workers and displaced persons in Europe before, during, and after the Second World War. At West Virginia University she pursues her PhD in history, focusing on modern Europe, war and society, and public history. Her current research delves into the role of British Quaker voluntary organizations and their participation in relief efforts in Europe following Allied liberation. Ceren Aygül conducts her PhD. project at Leibniz Institute of European History in Mainz. She focuses on the social and international role of Ottoman Red Crescent in the period of Balkan Wars and First World War. The title of her project is ‘Humanitarian Engagement of Ottoman Red Crescent in the Early Stages of Global Internationalism (1911-1927)’. Bastiaan Bouwman is a PhD candidate at the Department of International History of the London School of Economics and Political Science. His research focuses on ecumenical human rights promotion from the 1940s to the 1970s. Sarah Ehlers specializes in 20th century history in a global perspective with a particular interest in inter-imperial dynamics. Her dissertation investigates campaigns against Sleeping Sickness in colonial Africa. Pursuing a transnational approach, she focuses on understanding medical knowledge production associated with colonial practices of governance and the circulation of ideas and practices within and across empires. Rhian Keyse is an AHRC-funded PhD candidate at the Centre for Imperial and Global History, University of Exeter. Rhian’s doctoral research examines international, imperial, and local responses to the questions of ‘early’ and ‘forced’ marriage in colonial Africa. Ben Holmes is a postgraduate researcher in History at the University of Exeter. He completed both his BA and MA at Exeter, returning in 2015 to start an AHRC funded project co-supervised by the University of Bristol. His research interests cover modern European history, and post-conflict humanitarianism in particular. Yukako Otori is a PhD candidate in history at Harvard University, studying modern US and international history. Her dissertation tracks the development of American and international child labor laws in the 1910s to the 1940s. Her research is supported by the Fulbright program, the Konosuke Matsushita Memorial Foundation, and the Weatherhead Center for International Affairs. Andrée-Anne Plourde is a PhD student in history at Université Laval, Québec, Canada. Her research focuses on the history of children and youth and the history of charity and humanitarianism. Her current work focuses on the history of the Junior Red Cross in a transnational perspective during the first half of the 20th century. Patrick Quinton-Brown is a DPhil student at the Department of Politics and International Relations in the University of Oxford, where he studies as a Heaslip Scholar and SSHRC Doctoral Fellow. He is a graduate of the University of Toronto. Mark Reeves is a Ph.D. candidate in European history at the University of North Carolina at Chapel Hill. His dissertation, entitled “Lost Horizons: Anticolonial Internationalism, 1930-1970,” traces the interaction between anticolonialism and internationalism in West Africa, the Middle East, South Asia, and Southeast Asia during the crucial years of decolonization. Joanna Simonow is presently pursuing her PhD at ETH Zurich at the Chair for History of the Modern World. Her current doctoral project is funded by the Swiss National Science Foundation and is entitled “Framing ‘the Indian Famine’ and Its Victims, 1905-1951. The construction of public images of famine-affected populations in colonial, nationalist & global discourses on humanitarian relief”. This entry was posted in Actualités / News, Conferences, Networks and tagged GHRA 2016 ICRC Exeter Humanitarianism Human Rights by Fabian Klose. Bookmark the permalink.